A typical ion thruster converts gas (i.e., argon, xenon, or hydrogen) into superheated plasma. To expel high speed ions out of exhaust, a magnetic nozzle directs the ion motion into useful linear momentum. Ions accelerate to speeds on the order of 50,000 meters per second (about .000167 c). While this exhaust velocity far exceeds speeds achieved by exhaust particles from chemical fueled vehicles/s, it is not nearly enough to achieve g-force for a interplanetary range. However, an ion thruster might be a good way to inject ions into Thought Experiment's (TE's) onboard particle accelerator propulsion system. The best ion thruster might be the VASIMR plasma drive, now under development. U.S. astronaut-scientist-entrepreneur, ﻿ Franklin Chang-Diaz is developing a revolutionary rocket engine. His company, Ad Astra, is building the Variable Specific Impulse Magneto-plasma Rocket (VASIMR). A very different type of propulsion system, VASIMR uses plasma, the stuff of stars, to propel spacecraft. Chemical Operations. Current design limitations constrain a chemical fueled rocket to short period "burns". Therefore, one short chemical burst at beginning of flight will speed the vessel to an orbital path to the destination; another short burst at end of voyage slows the vessel to adjust speed with destination orbit. With no additional thrust during the flight, the vessel must stay in a carefully planned Solar orbit for most of the flight. Plasma Performance. Reason for plasma's improved performance, plasma engine constantly propels spacecraft (via plasma ion exhaust) throughout the voyage; this achieves greater speed and does not constrain the vessel to an orbital path. VASIMR uses radio waves to heat gases to plasma state (millions of degrees). This greatly increases rocket performance which improves with hotter exhaust; thrust greatly exceeds that of chemical reactants which only reach thousands of degrees in a conventional rocket engine. Deep-space operations will likely require nuclear power to provide the wattage needed to heat the plasma. Thrust from the plasma engine could boost a spacecraft for a longer time and with better efficiency than conventional engines. SUMMARY: While chemical rockets combine chemical reactants (such as hydrogen and oxygen) for a quick burn, VASIMR exhaust gets much hotter then chemical reactants without burning. It heats a gas until it becomes plasma; the hotter the exhaust, the faster the rocket. Assume ion exhaust throughout entire voyage. Deceleration Distance. Assume equals acceleration distance. Assume typical trip time is 3 months. Axiomatic: half of total time. Divide total distance (d) by total time (t). Conclusion: After 45 days of VASIMR acceleration, ship's max velocity is about same as a typical asteroid's orbital velocity. in a closed system, momentum exchanges are equal. EXAMPLE: a space borne vessel is a closed system. ship's larger mass × a small increase in ship's velocity. IMPULSE: Momentum per time.To determine impulse, divide each side by one second. ---ffSec (fuel flow consumed per sec) ≈ exhaust mass per sec. ---100% efficiency (all consumed particles contribute to thrust due to exhaust). assume exhaust particle velocity of 1 million m/sec. Thus, a particle exhaust rate of .025 gram/sec will propel the 5 metric Tonne (mT) vessel 5 millimeters/sec faster for each second of powered flight. .025 gm is a small quantity of mass; how much fuel would be required for constant thrust throughout the 90 day voyage to Mars? First, compute vessel's daily fuel requirement. If a 5 metric Tonne (mT) vessel expends .025 gm of plasma for every second of powered flight, then daily fuel consumption is .00216 metric Tonne. Fuel requirement for entire voyage can be computed as a percentage of ship's initial gross weight. Given above flight profile, determine what size ship can VASIMR propel with fuel consumption rate of one gram per second? For every gram of ffSec , MShip equals 200 mT. For transport between planets, VASIMR proponents now call for a traditional chemical rocket to insert VASIMR vehicle into Earth orbit. Then, humans will enter the VASIMR powered interplanetary vehicle and travel to Mars with plasma drive. This would be much more efficient than a traditional orbital insertion via a chemical rocket. For a trip to Mars, plasma drive is much faster than a chemical rocket. Plasma engine stays on throughout the entire trip; thus, velocity constantly increases. In fact, it increases so much that flight profile calls for a "slow down" at mid-way. At a carefully chosen position near mid-way, vessel flips around to propel in opposite direction and start decelerating. Otherwise, the vessel would arrive at Mars way too fast for orbital insertion. VASIMR's middle name is "Magneto-plasma" because magnetic fields can control plasmas. While way too hot for material containers (>1,000,000°C), plasma's charged ions respond very well to magnetic forces. Thus, VASIMR uses a magnetic "flux tube", an invisible sleeve shaped like a nozzle; a magnetic nozzle. Technology of plasma containment originates from research in magnetic fusion, Dr. Chang-Diaz's original field. For magnetic fusion, one must confine the plasma away from any material walls; then, heat it and compress it to thermonuclear temperatures to ignite the plasma. A persistent obstacle to fusion energy has been the difficulty of containing hot, electrically charged plasma. Ironically, this plasma confinement problem led Chang-Diaz to an opportunity; use a controlled plasma leak to propel spacecraft. Well arranged VASIMR components enable super heated, high speed plasma to exit in one direction to create thrust to propel the spacecraft in the opposite direction. 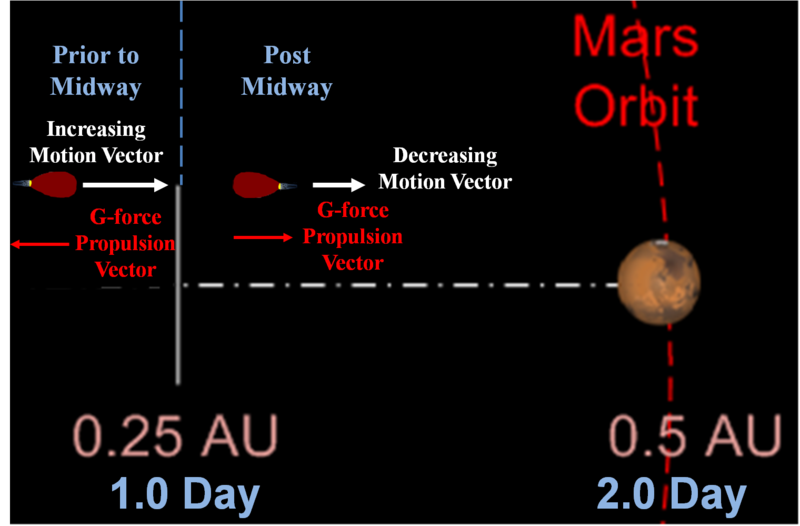 Use short burn to leave Earth's orbit, enter a new Solar orbit from Earth's orbit to Mars's orbit; then, accomplish a 2nd short burn to enter orbit of Mars. With only chemical reactants, the shortest possible trip would be 6 months in a partial orbit. Most estimates call for a much longer trip. Most practical use for chemical reactants would be to move vehicle from Earth's surface to Low Earth Orbit (LEO). Even this dangerous manuever could be avoided once a space elevator is constructed. While 3 months is shorter than 6 months, it's still a long time to spend in near 0-g conditions. A more practical use for a plasma drive engine (such as the VASIMR) would be as a plasma injector into a particle accelerator propulsion system. High temps (>1,000,000°C) greatly expand fuel’s volume as it transforms from gas to plasma. However, relativistic effects are slight as mass increase is at most one thousandth. Thought Experiment (TE) introduces a third choice. Present day accelerators routinely take ions to near light speeds; thus, TE conservatively assumes exhaust particle velocity of .866c which introduces a relativistic growth factor (n) of 2 (particle is going so fast, it doubles in size). Considering both this enormous velocity and relativistic growth of exhaust particles at this speed, TE uses simple momentum exchange equation to show that particle exhaust flow of .1 gm/sec will propel a 5 mT vehicle about 10 m/sec faster for every second of powered flight. Such acceleration provides g-force to simulate Earth surface gravity (g-force) during powered portions of flight. Furthermore, a trip time to Mars reduces from months to just days, a much more reasonable duration. about 9.8 m/sec faster for every second of powered flight. If vExh is already expressed as decimal c, then determine dc by inspection. If no "burn" during entire trip, then exhaust particles are static inside the vehicle. TE generously assumes controlled plasma leak at 1 million m/sec, ﻿about 1/3 of 1% light speed (c). TE conservatively estimates exit speed from particle accelerator at 86.6% c; much less then routinely achieved with current technology. With no propulsive force, ship is constrained to orbital velocity. Thus, TE assumes zero acceleration. Step 1: Reduces to average velocity gain less than 0.5 m/sec. Step 2: Divide by g (9.8m/sec²) to convert to "decimal g". Result: Almost 5% Earth gravity, very little g-force! g is 9.80665 m/sec2, acceleration of a free falling object near Earth's surface. TE assumes g as the value for ship's acceleration. Crew feels same downward force (g-force) as Earth surface gravity. AShip: Acceleration of vessel is given in decimal g.
Determine each acceleration in meters per second per second (m/sec2). Given constant acceleration, let initial velocity (V0) be zero; then, determine final velocity(V1) one second later. Convert each value to decimal g as shown. Thrust depends on exhaust momentum. MShip's potential mass depends on thrust. Substitute terms from previous work. Substitute values for light speed (c) & gravity (g) and recombine. MShip is in metric Tonnes (mT). With no propulsive force, ship's mass is unconstrained. 2.017×106ffExh Given particle exhaust speed at 1,000,000 m/sec, and forward motion of .05g, ship's mass is constrained at about two million times the mass of exhaust fuel expelled per any given second. Two kilograms/second of exhaust particles at .866c can g-force propel a vehicle of 52 kiloTonnes. However, g-force fuel consumption must factor in Relativity and Efficiency. Since static particles have zero velocity, relativity does not bear. Since one million m/sec is slow relative to c, relativistic mass growth is very slight. Here, it is optimistically estimated as a thousandth. At .866c, Lorentz Transform tells us that particle's relativistic mass is double the particle's mass at relative rest. Relativistic Growth (n) factor comes from the Lorentz Transform which can be used to quantify mass growth due to relativity. ffSec: fuel flow per second, mass per second consumed at rest. This quantity converts to plasma prior to injection into particle accelerator. Note: n can be any rational number >1.0, but choosing certain dc values gives integer growth factors. Choosing particle exhaust speeds with corresponding growth factors as integers is a convenience but in no way a requirement. exits the spacecraft for propulsion. consumed fuel mass grows to become fuel flow exhaust. ﻿﻿5. Efficiency (E) is a value between 0 and 100% which reflects inevitable design flaws and peripheral needs which inevitably decrease expected output. However, TE further assumes a learning curve in the design process. Thus, propulsion efficiency will start out low as we journey to nearby destinations such as Mars and Ceres. However, TE assumes efficiency will gradually improve as we learn to design better vessels to journey to further destinations. Disregarding efficiency concerns, TE previously determined that a g-force ship of 52,666 mTs theoretically requires consumption rate of 1.0 kg/sec (ffsec). This consumed quantity of particles must accelerate to .866c (Vexh) and relativistically grow to become 2.0 kg of exhaust particles (ffExh). Now that we realize inefficiency is inevitable, we optimistically assume E=70%; thus, 70% of the 2.0 kg might survive the acceleration process. Unfortunately, this results in 70% of the thrust, and only seven tenths of the g-force is achieved. G-force vessel must compensate for this shortfall. 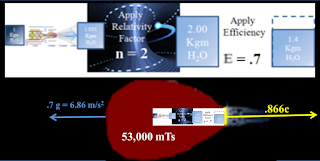 Relativity: as initial fuel mass speeds up from relative rest (0 m/s) to .866c, initial 1.0 kgm per sec grows to an exhaust flow of 2.0 kgm per second. Theoretically, this should g-force propel a vehicle of 53,000 mTs. However, above equations disregards inevitable inefficiencies. Like all other systems, G-force spaceships will never achieve 100% efficiency; however, the conversion rate from at rest, consumed particles (ffsec) to near light speed, exhaust particles (ffExh) will improve over time. Since system inefficiencies are inevitable, actual thrust produced from theoretical fuel consumption requirement will be much less then needed for g-force. For this example, TE optimistically assumes system efficiency of 70%. Thus, system inefficiencies divert 30% of plasma particles away from the thrust stream. While relativity increases the consumed 1 kgm of fuel to 2 kgm, only 1.43 kgm would actually exit the vehicle in the exhaust flow. In this arbitrary scenario, an onboard weight scale would measure a 100 lb object at only 70 lbs. CONCLUSION: At 70% efficiency, fuel consumption of 1.0 kgm produces enough thrust for only .7g-force. Thus, TE uses an efficiency factor (ε) to determine added consumption required for g-force. Efficiency Factor (ε) is reciprocal of Efficiency (E). To compensate for system inefficiencies, consumption rate must increase. In TE's fictional, arbitrary example, determine the Efficiency Factor (ε) by dividing 1 by E. Then, determine increased consumption rate by multiplying original rate by ε. Thus, consumption must increase from 1.0 kg/sec to 1.43 kgm sec as shown. In retrospect, an efficiency rate of 70% is very optimistic. System efficiency for initial g-force flights will likely be closer to 10%. Efficiency of 90% probably won't happen until lots of g-force flights push the learning curve for many years. Design flaws, for example, particle collisions will likely stop a significant portion of particles from exiting vessel. Arbitrarily assume this causes 10% inefficiency. Systemic power needs; propulsion system components will need power. particle accelerator devices such as collision detectors, possible even the magnets (see next chapter for more on magnets) will need power even though these components don't directly contribute to propulsion. Arbitrarily assume this causes 10% inefficiency. Auxiliary Power. Life support, comm gear, nav gear and many other items are needed for ship operation and crew comfort, but not part of propulsion system. However, a portion of propulsion power will likely be diverted for these purposes.Arbitrarily assume this causes 10% inefficiency. Actual efficiency (E) will need to be validated with empirical data. Very little fuel expended per day; so, this efficiency is close to one. Considerable fuel consumption; thus, inefficiencies are inevitable. If exact values are not yet known, make reasonable assumptions. For g-force propulsion, a 53 megaton must emit an exhaust flow (ffExh) of 2 kg/sec with particle velocity of .866c. To achieve this exhaust flow, theoretical "at rest" fuel consumption rate is 1.00 kg/sec; and relativity will grow the particles to 2.0 kg/sec. HOWEVER, practical fuel consumption must consider inevitable inefficiencies. Thus, apply the Efficiency Factor (ε), the reciprocal of Efficiency (E). EXAMPLE: For E=70%, ε = 1/E = 1.43. Increasing 1 kg by a factor of 1.43 results in 1.43 kg/sec consumed at rest. Accelerate this to .866c, and it relativistically grows to 2.86 kg. Since this example assumes 70% survival rate, the exhaust particle flow reduces to 2.0 kg, the amount needed to create g-force. Following comes from Lorentz Transform (LT). 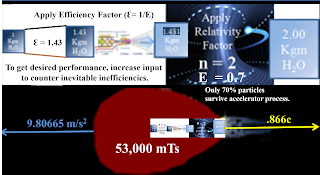 their mass grows by relativity growth factor, n.
(3) Practical fuel consumption, ∇Sec. Fuel flow, ffsec, is consumed at relative rest. (Effic. factor, ε, is reciprocal of Efficiency, E). (4) Daily fuel consumption can be approximated. Multiply by 86,400, seconds per day. For a g-force spaceship, dg = 1. For other drive types, dg << 1.
and no hurry to get there. Tolerable for robots but not humans. compute and apply very small values of dg. Relativistic growth of n=2 due to exhaust velocity of .866 c, light speed. Resulting momentum enables g-force propulsion (thus, dg=1). Arbitrarily assume E = 70% for an efficiency factor of ε = 1.43. Requires the most daily fuel consumption, .233% of vessel's GW. G-force benefits: inflight comfort & quick flight time. (6) ∇Day is a percentage of ship's current gross weight (%GW). Daily decrease of ship's GW (∇Day ) depends on Efficiency Factor (ε), relativistic growth (n) and ship's acceleration (dg, expressed as decimal g). Flight profile calls for a partial orbit at orbital speeds. A small amount of constant propulsion can reduce trip time by as much as half. accummulate all the daily GW differences for entire trip. Multiply daily diff (∇Day) times total trip time (t). or for short trip durations. Both these circumstances exist in following table. No fuel expended during flight. to enter/exit orbit of flight. EXAMPLE: Let total trip duration (t) be 40 days. Initial approximation estimates total fuel consumption is 40% initial gross weight (GW0). Thus, if GW0 = 100 mTs; then, final gross weight (GW40) is about 60 mTs, and total fuel consumptions is about 40 mTs. Easy to compute, but inaccurate!!! A more accurate model of fuel consumption might involve exponents. Axiomatic: If daily fuel consumption is 1% gross weight (∇t = .01 GWt), then succeeding day's gross weight will be 99% of previous day (GWt = .99 GWt-1 ). Exponentials can determine fuel consumption for longer duration flights. SUMMARY: In succeeding days of powered flight, ship's Gross Weight (GW) decreases due to fuel consumption. Subsequently, lighter ship requires less fuel, and fuel consumption decreases. To model this, TE initially considers a convenient rate of fuel consumption (ffsec=1.0 kg/sec); then, TE determines ship's GW. For particle exhaust speed of .866c, n=2. Thus, √(n2-1) = 1.73. For g-force propulsion, dg = 1. For convenience, consider fuel flow (ffsec) of 1.0 kgm/sec. Theoretically g-force propels a ship of 52,886 mTs. However, it's much more likely that flight planners will first determine Take Off Gross Weight (TOGW); then, flight engineers will determine practical fuel flow requirements based on planned TOGW and known efficiency factor (ε). Rearrange and adjust for best known efficiency factor (ε) to determine ∇sec. Let ε = 1.43, same arbitrary value as current example. Let MShip = 100,000 mTs. decreases for each day of powered flight. Ship size shrinks during powered flight due to fuel consumption. Smaller GW means decreased fuel requirement; thus, fuel consumption decreases. fuel decreases throughout powered flight. Example: 40 days. Someday, a g-force trip to Kuiper Belt could require 40 days. Thus, reconsider previous example of 40 days duration with ship size of 100 kiloTonnes. Decreased daily consumption translates into smaller fuel flow rates. To determine fuel flow for Day 1, divide total fuel consumption by total seconds per day. and so on for succeeding days. a significant 234.5 gm/sec less then the initial flow fuel for Day 1.
fuel flow must be constantly monitored and adjusted. G-force sensors (i.e., scales with 100 lbs. weights should indicate 100 lbs. throughout powered flight). Sensor servo connection could automatically adjust fuel flow. Specific impulse is measured in seconds. EXAMPLE: one pound of typical solid rocket motor fuel produces one pound of thrust for 250 seconds. In contrast, Impulse (I) is the average propulsion Force (F) times the total duration (t) of firing. Straight forward work rearranges terms for Impulse equation such that Impulse equals exhaust mass flow times velocity of exhaust particles. Effects of relativity on size of exhaust particles. Recall ffExh is the amount of exhaust mass per time ejected out of the rocket (adjusted for relativity). Assuming constant exhaust velocity, we get: I = ffExh × vExh where m is the total mass of the propellant. We can divide this equation by the weight of the propellants to define the specific impulse. The word "specific" just means "divided by weight". Thus, Specific Impulse (Isp) shows Impulse from each unit weight of propellant. For example, typical solid rocket motor produces 250 pounds of thrust for every pound of fuel injected into the combustion chamber (per second). The specific impulse Isp is given by: Isp = Veq / g0 where g is the gravitational acceleration constant (9.8 m/sec2 in metric units). Mathematically, the Isp is a ratio of the thrust produced to the weight flow of the propellants. Use fuel flow (through the exhaust nozzle) to determine rocket thrust. It indicates engine efficiency. A higher value of specific impulse shows greater efficiency, more thrust for the same amount of propellant. It simplifies; Isp units are the same for English units or metric units. Preliminary analysis: It gives us an easy way to "size" an engine during The result of our thermodynamic analysis is a certain value of specific impulse. The rocket weight will define the required value of thrust. Dividing the thrust required by the specific impulse will tell us how much weight flow of propellants our engine must produce. This information determines the physical size of the engine. CONCLUSION: G-force vessel must vary daily fuel consumption. Fortunately, VASIMR's first name is "Variable"; thus, will vary plasma quantity injected into particle accelerator.